January 22, 2015 Geren W. Mortensen, Jr. I've finally completed a pair of subwoofers for the PA system. They were designed around the 15" Peavey Scorpion Plus drivers from the old 1510HT PA speakers I retired when I purchased the new PVx15 mains. 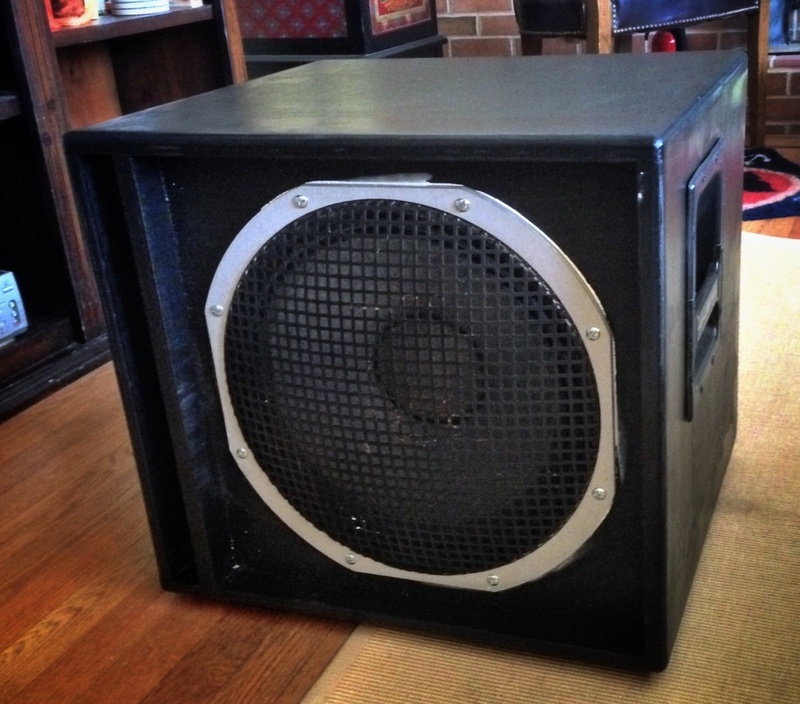 I also re-used the massive Peavey handles, which make the 40-pound speakers really easy to carry. I knew that the bottom end response of the 15" Scorpions was a little high for typical subwoofers, so the cabinet had to be designed to "pull" the effective response of the speaker down to a point where it would provide sufficient thump. To do that, I knew that the effective volume of the cabinet would have to be around 3 cubic feet. I also knew that the actual size of the cabinet had to be pretty small to fit into my Hyundai Elantra Touring, a fairly small "station wagon." I used the RE Audio online design calculator to come up with the exact dimensions for the enclosure and the length of the folded slot port that tuned the box resonance to about 25Hz, while still maintaining the size requirements. All the theory aside, what's really important is the end result -- how do the things sound? I've only done some limited testing, but from what I've heard so far, they sound really good. When paired with either the Peavey PVx15 mains, or the little Carvin PM10 speakers, the low end is rich and tight, with a respectable thump. The real test will come when they debut on a sound gig for local rockers, Sneaky Pete. Check the Events Calendar for more info on that, and other upcoming gigs.